If you’re in need of a simple, healthy breakfast in bulk or something to feed the family over the weekend, this oatmeal bake has you covered. It’s high volume (filling), high protein, and has real peanut butter inside so you know it’s tasty. And before you dive in, I’ll add that even if you just need one serving, the recipe is super easy to cut down to fit your needs. This oatmeal bake is as easy as throwing everything in a bowl, mixing, and baking. So, I’ll just briefly touch on a few ingredients you might have questions about modifying. The recipe calls for vanilla with added cocoa powder. But feel free to use a chocolate protein powder if that’s what you have on hand. You might add an extra 1/3 scoop to account for the loss of cocoa. 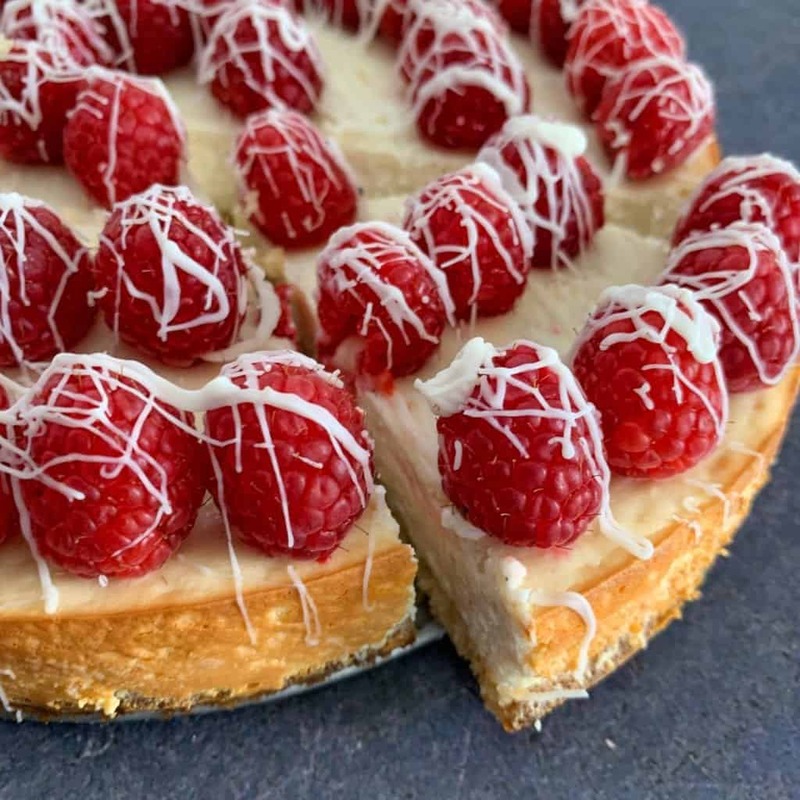 Like I mentioned in my white chocolate raspberry protein cheesecake, one of the most important things to keep in mind when using other protein powders is scoop size. I used Bowmar Nutrition’s Protein Frosted Cookie which weighs 28 grams per scoop for a total of 84 grams. 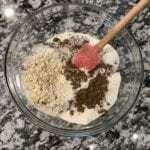 Be sure to match this if you use another protein powder to avoid a dry or tough oatmeal bake. 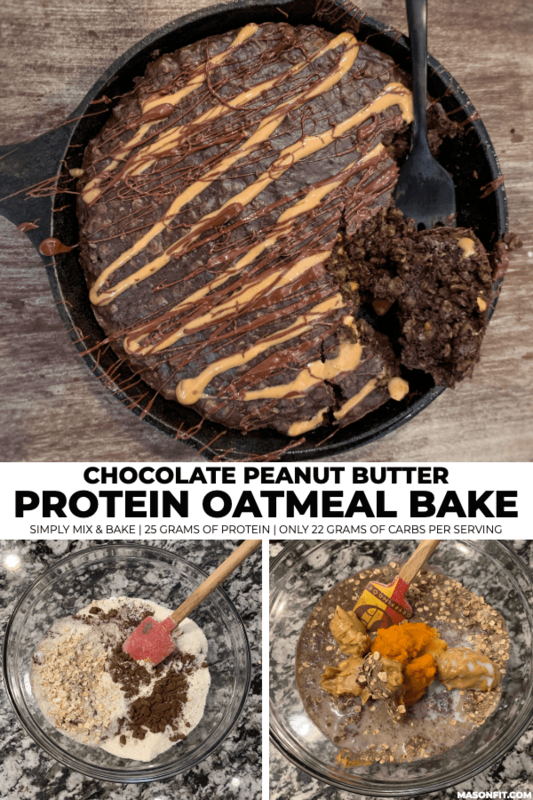 A lot of my protein oatmeal recipes (like the infamous Butterfinger Proats) use quick oats for fast cooking. If you wanted to use quick oats instead of rolled oats, that should work fine but the oatmeal bake might cook a bit faster. Ah, the real MVP—peanut butter. You can use any nut butter you’d like for this oatmeal bake, but I wouldn’t recommend using something like a powdered peanut butter. You’ll need some fat to balance the protein powder and avoid a dry and tough finished product. The canned pumpkin is there to add some fat-like properties without the actual fat and calories of something like peanut butter. You’ll never know it’s there but if you wanted to use something else, try unsweetened apple sauce, another fat source, or just more peanut butter. 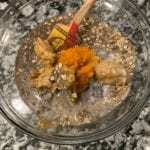 I will add that if you wanted to reduce the fat even further and deal with a slightly less delicious oatmeal bake, you could use the powdered peanut butter and use more pumpkin. You can also use a full fat milk to accommodate for some lost fat from other ingredients. All right, let’s get to cooking. If you make this oatmeal bake, I’d love to see it! Snap a pic and tag me on Instagram @mason_woodruff. Or you can join my free Facebook group and share it with the Proton Party. 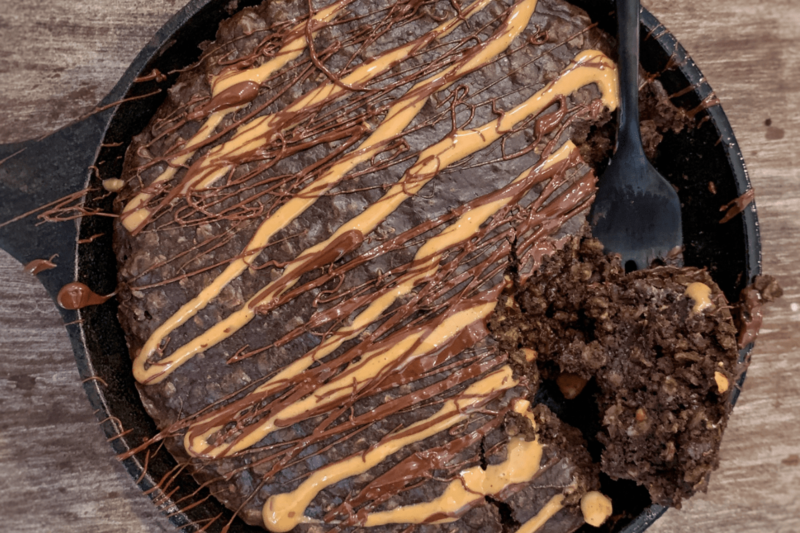 Oatmeal and protein powder mixed with crunchy peanut butter and dark cocoa—all baked for one gooey breakfast treat. Add the pumpkin, peanut butter, and milk. Stir well. Transfer the ingredients to a 6.5" cast iron skillet or similar sized baking dish. Different dishes will affect cook time. Smooth the top of the mixture and bake for 17-20 minutes, depending on the dish and desired center. I purposely left out any food safety concerns so you can have this like gooey oatmeal or more done like a breakfast cookie. Macros are for 1/4th the entire recipe and do not include any additional drizzle. For the drizzle, I melted a tablespoon of peanut butter and chocolate chips. Want to incorporate some veggies into your breakfast in a fun way? 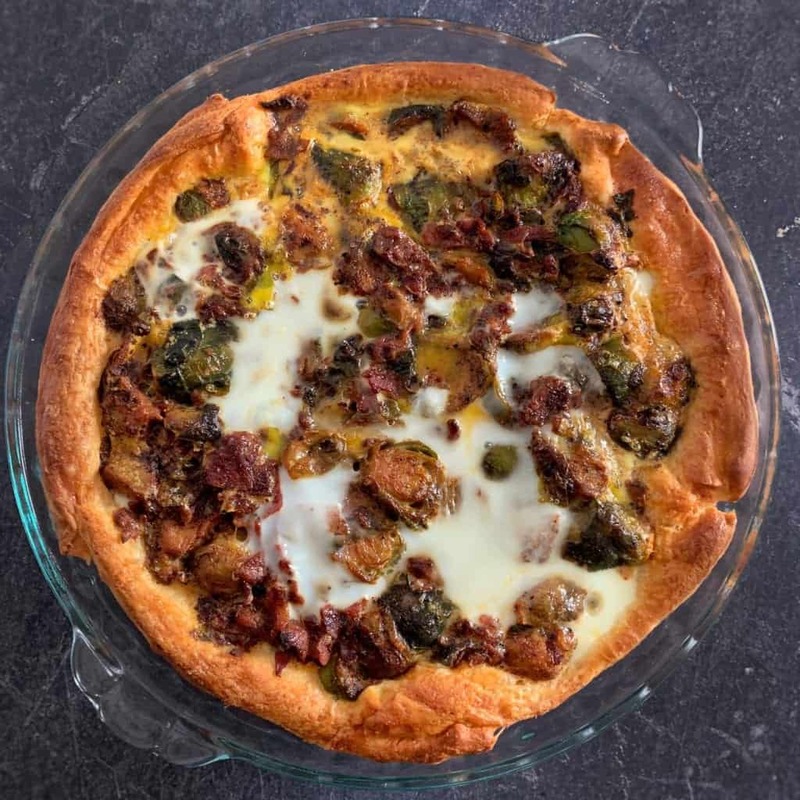 My honey bacon and brussels sprouts breakfast pie should do the trick. 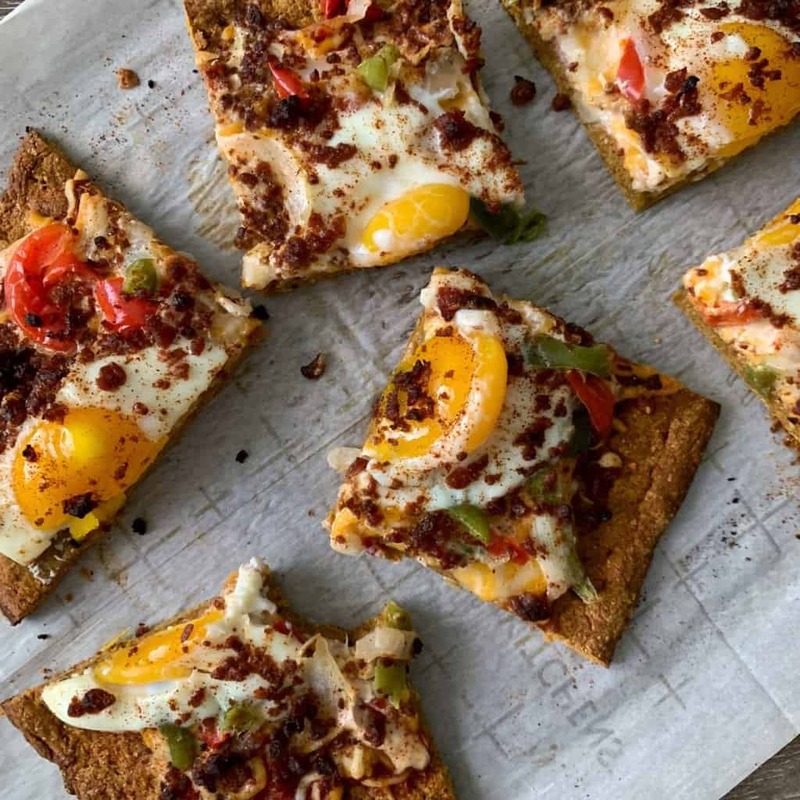 And if you’re wondering what to do with leftover pumpkin, check out my savory breakfast pumpkin pizza. 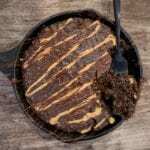 Did you use your 5” cast iron skillet for this or a larger one? Yes ma’am, I used the 5″. Soooo good! 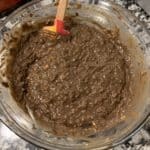 I quartered the recipe and used PE Science chocolate peanut butter protein. Was seriously so good! Oh man! This was yummy! I drizzled some sf choc syrup and some sf caramel sauce on top…DELICIOUS! I love how quick and easy this is to make. This is great for meal prep sundays. This week I’m going to try making it replacing the milk with coffee. Made this for family we had in town and drizzled some WF chocolate sauce and it was a big hit!